It’s piano recital season! Your students have spent hours at home practicing the same piece over and over until it can be played inside out and backwards. Your lessons are spent rehearsing and polishing and perfecting. When the “big day” finally arrives, your kids will be a well-rehearsed group that is excited to share their progress with a room full of family and friends. Everything has been done to ensure the most successful performance for each one of your students. Everything should go off with out a hitch… right? So how do you prepare your piano students for the off chance that something “goes wrong” mid-performance? What is your advice to your young students for dealing with on-stage mistakes? We’ve all been in an audience when a young performer makes a mistake. As much as you prepare and hope for a polished performance, the students you teach are often young children, and their responses to nerves and the pressures of performing can be unpredictable. A student we assume is as cool as a cucumber can morph into a jittery mess in a matter of seconds. So, this leaves you with a final piano recital preparation task… teaching your students what to do when something goes wrong. Your students need a “survival plan” for piano recital “slip-ups” and in today’s post we’re going to help you generate one. When you were a young piano student, how did your teacher prepare you for recital stumbles. Were you taught to “keep going no matter what?” or were you taught to stop, re-group and start again? These are two very different approaches to a common piano recital occurrence. So today we thought we’d weigh in on the pros and cons of both and then open the debate up to our readers. As we all have different approaches to teaching, you’ll then have the information you need to decide which option works best for you and your studio. How many times during a piano performance have you watched one simple slip turn into a recurring heap of fumbles that ends in a dramatically painful climax… on the wrong note. Often one mistake can rapidly spiral and set your piano students off on a performance filled with angst. Enter the recital with less pressure. Knowing that they have the option to regroup and start again means that your piano students begin their performances with the knowledge that they are in complete control. This can really help perfectionist students who desperately want to deliver a shining performance. Have the opportunity to get rid of the mistake-induced adrenaline that hits fast and furious with the first missed note. That jolt of “oh no!” can flood your students’ bodies with a mid-piece “fight or flight” response that results in even more mistakes that would not normally have happened if they were instead given the opportunity to stop, breathe and “shake it off”. Teaching Tip: Want to help students overcome performance anxiety? Read this. Relax their audience by taking command of their performance. Audiences are empathetic to nervous performers and a piano student who is fumbling is hard to watch. Instead of having their audience cringe and feel sorry for them as they stumble through a performance, by starting again your students will gain the chance to press the re-set button and have an audience who is relaxed knowing they are indeed in control. Have the chance for a “teacher intervention” if needed. We’ve all seen new beginners who start on the wrong keys and play their entire piece in an unintended polytonality that leaves the audience slightly baffled. But if given the chance to start again, a helpful whisper from a teacher can get them back on track and enable them to deliver the performance they intended. If you view your recitals an extension of the learning that happens in your studio, then learning to deal with a mid-performance mistake as a professional musician is certainly an important skill to practice. 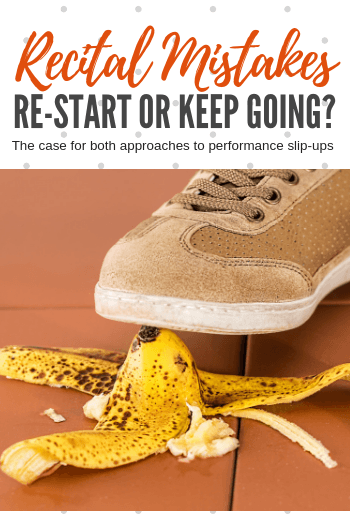 If piano students continue with their performance no matter what, audiences are often none the wiser… so why call attention to a mistake by stopping and starting again? Learn real-world coping skills for when they are an accompanist or a member of a musical group. As a collaborative pianist, the opportunity to stop and re-start due to a mistake is non-existent. Therefore, the ability to re-group “on the fly” is an important ability that has to be practiced in these settings where nerves are present. Avoid calling attention to the mistake they made. Most audiences are not familiar with the solos your piano students will be performing. This means that, while mistakes may be glaringly obvious to you and your student, the audience often has no idea they even happened! Continuing with performances therefore doesn’t call attention to the mistakes and gives your students the chance to dazzle with seemingly flawless pieces. Avoid the “contagious” effect that the “re-start if needed” option can sometimes cause among other students in your studio. Nervous students can feed off each other and those who would not normally need to re-start will suddenly jump on the bandwagon of “Maybe I should start again.” Before you know it, your recital can feel disjointed and become much longer than it needs to be. Teaching Tip: Do you struggle with audience members leaving a recital early. Read this. Definitely finish their piano pieces. Some students can become so crippled by nerves that re-starting after a mistake is not always an option. Their brains shut down and thus, getting to the end of their performances becomes a gargantuan task. Continuing to play, even with mistakes, ensures that they (at the very least) perform their pieces through to the end. So where do you stand? Granted, it can be hard to decide. After all, each case has very strong pros and cons. But no matter what you choose, what we do know for sure is that prepping your students with one of these two options is the key to a successful and positive experience for your piano students’ success. Share below…what do you teach your piano students to do if they make a mid-performance mistake?